Do you ever run courses in the North West or even Yorkshire or the Lake District? I am considering attending a basic 2 day course with my son (age 14), but the South West is too far to travel. At present, we only run our weekend courses at our Sussex site but we may extend to a northern venue too. 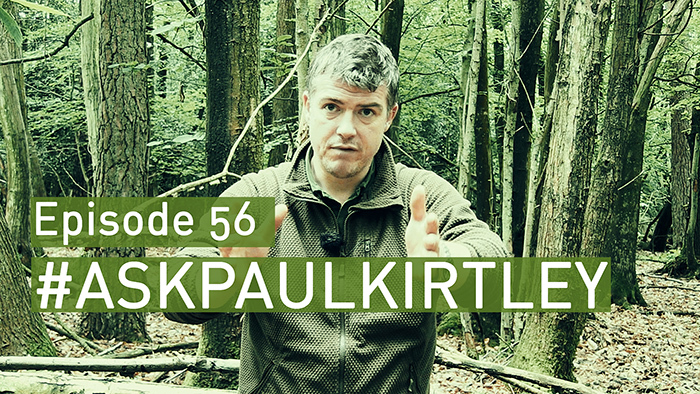 Another great episode paul,thanks for answering my question.Had a great time on the elementary wilderness bushcraft coarse which you ran at frontier bushcraft.i highly recommend it to anyone that wants to excel at bushcraft skills.thanks again. You’ve made some really good points about fire and tarps. I still like to play around with various ideas with pitching a tarp, some better than others but none-the-less, my own take on it. Thanks again for an excellent Q & A episode. Hi Phil. I’m always interested to hear what solutions people come up with. You make a lot of sense as usual. I really appreciated your in-put about keeping fires alight during sleep periods. As an older man I wake up a lot through the night so fire no issue. Yes drying wood and kindling/tender important on an on-going basis! Keep up the great work you do-appreciate the videos and photos of UK wild lands and flora. Thank you for your comment about that stupid video wave about fire reflection walls! Of course a double lean to construction or a laavvu or Sami kotta offers a heated room. But a Garden Fence in such a distance is idiotic! The only reason can be to hide the fire. But the second lean to is faster done, especially if it is constructed in a V-angle with the closed side against the wind a good option. Your jacket interests me, the waffel structure looks light and warm under a cotton ore Goretex outer layer. Who is producing it? The jacket is the Alpha jacket from Helikon-Tex. Really enjoyed this podcast , very interesting and some good info. Good to have a rant now and again ..
Glad you liked it Andrew. Thanks. Did you know that you will find loads of super-fast and fresh ELITE and SOCKS5 proxies at https://publicproxy.net/ – try them! Free for all! I see that this particular Ask Paul piece is already somewhat dated, and I will be even more grateful if you manage to find this question and let me know where your line is drawn in the sand on this particular subject. Hi again Jennifer, I’m glad you like the attitude and the terminology. Quick question on the plastic sheeting – where are you going to get the sheeting from? As another point on putting plastic in between you and the fire to keep the smoke at bay, when the conditions are truly cold, the size of fire combined with how close you need to be to it in order to benefit from the radiant heat (NB inverse square law) would mean the plastic is likely to melt. Check the articles on this site on lean-tos in the boreal as well as long-log fires. I’m note sure how the plastic would fit into this equation when a lean-to and fire combo is really needed to be relied upon for outdoor safety/survival as opposed to playing around in the woods. That being said, have a play with it. I am a firm believer in being open minded and experimenting. Finally, depsite my somewhat rhetorical question about where the plastic sheet is going to come from, if you are going to pack plastic sheeting with you, perhaps consider building a Mors super-shelter, which is very efficient thermally. Hope this helps delineate some of my thinking. I found the long log fire article last year, and will look for the lean-to articles as well. Our snow has been stolen from us by a recent warm front and rain, so I will prioritize making our fire pit larger before the ground freezes once more.